The year 1809 saw the publication Of the first Hebrew Psalter in America, indeed the first printing of any portion of the Hebrew Bible, Sefer Tehilim, Liber Psalmorum Hebraice, Cambridge, 1809; and of the two-volume A Compendious Lexicon of the Hebrew Language, by Clement C. Moore (1779-1863), printed in New York. Volume I contains "an explanation of every word which occurs in the Psalms"; volume 2 is "a lexicon and grammar of the whole language." The Preface offers a mode of study which will enable "any person acquainted with the general principles of language, without the aid of a teacher, to read and understand the Holy Scriptures in the original Hebrew." Facing page: This first publication of the entire Bible in Hebrew in America appeared in Philadelphia in 1814. was based on the second edition of the Athias Bible (see exhibit item 35) but, unlike that edition, it was printed without vowel marks. It was not till 1849 that a vocalized Hebrew Bible was published in America. 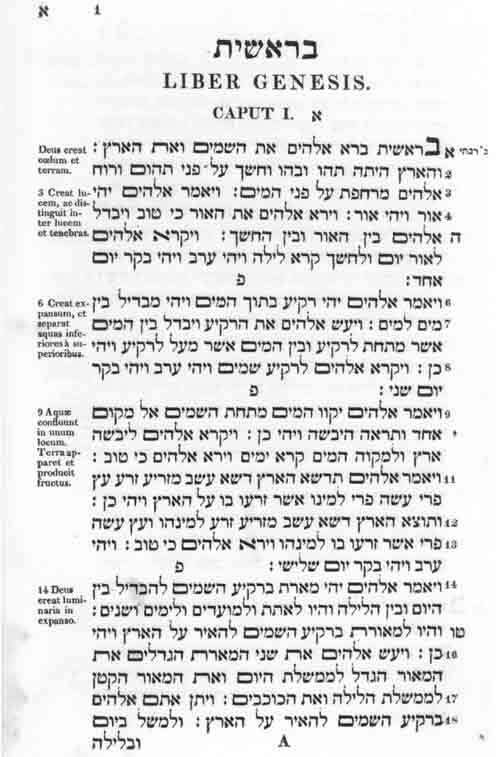 Here we see the first page of Bereshit, Genesis. Biblia Hebraica, 2 volumes, Philadelphia, 1814. Hebraic Section. In the year 1812, Mr. Horwitz had proposed the publication of an edition of the Hebrew Bible, being the first proposal of the kind ever offered in the United States. The undertaking was strongly recommended by many clergymen ... and a considerable number of subscriptions for the work were obtained by him. Early in 1813, Mr. Horwitz transferred his right to the edition with his list of subscribers, to Thomas Dobson, the present publisher.... The first volume is now published. The printing of the second volume, which will complete the work, is considerably advanced; and the publisher hopes to have it completed in the course of a few months. Mr. Horwitz's was not in fact the first proposal for printing a Hebrew Bible. In 1810, Mills Day of New Haven issued a proposal for "publishing by subscription an edition of the Hebrew Bible," and attached to the proposal a sample printing of the first chapter and a half of Genesis. The subscription price was $3.25 for each of the two volumes planned. Two years into the project, at age twenty-nine, Day died and the project died with him. Jonathan Horwitz, recently arrived from Amsterdam with a font of Hebrew type, now made his proposal, but he was not alone. The New York publishing firm of Whiting and Watson announced its plan to publish a Hebrew Bible under the patronage of the Theological Seminary at Andover. Horwitz countered with an advertisement in the New York Evening Post (January 16, 1813), declaring not only that he had received the patronage of Harvard College and the Andover Theological Institution but also that both institutions had already subscribed for forty copies each. Horwitz had even more competition to contend with. Two leaders in missionary work, John M. Mason and James McFarlane, were ready to enter the field, and in 1812 the president of the London Society for Promoting Christianity Among Jews, the apostate Joseph Samuel Christian Frederick Frey, had already published the first volume of a vocalized Bible for the English-speaking countries. It was rumored that as soon as the project was completed, he would depart for the United States to see to its distribution there. Faced with all this competition, what was a pious foreign Jew to do? Horwitz decided that discretion was the better part of valor. In 1813, he sold his type to the Philadelphia printer William Fry, and his subscription lists to the bookseller Thomas Dobson, and entered the medical department of the University of Pennsylvania from which he received his M.D. in 1815. After the "lean years" which followed the Revolutionary War, in the early decades of the nineteenth century America was in the throes of a great religious revival. As part of its intellectual aspect, the study of the Hebrew language was renewed. Much of it revolved around Moses Stuart, Professor of Sacred Literature in the Theological Seminary at Andover, and his disciples. Grammars, lexicons, and chrestomathies were published, as well as books on the Bible and the Holy Land. The Jewish community was wary of these activities because the same scholars and divines were also involved in missionary activity. The appearance of a work on the Hebrew language which bore approbation from both leading Christian clergymen and leading Jews marked the beginning of friendlier intellectual discourse.